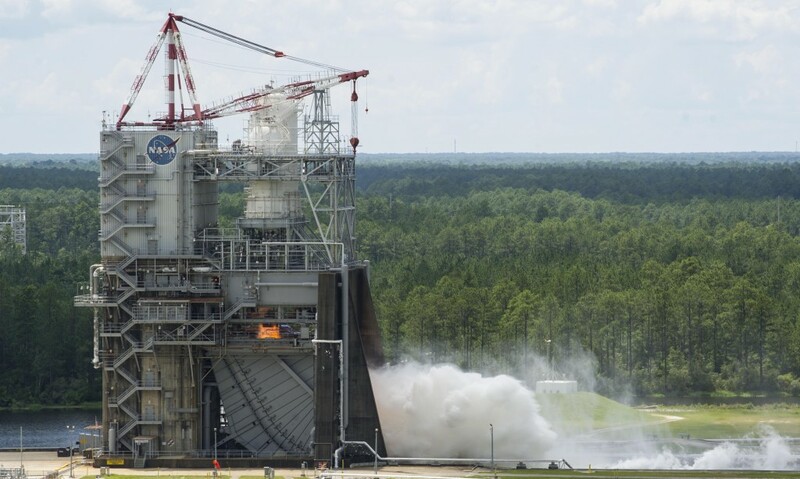 June 12, 2015 – An RS-25 engine fired up for 500 seconds June 11 at NASA’s Stennis Space Center near Bay St. Louis, Mississippi. Four RS-25 engines will power NASA’s Space Launch System to speeds of 17,500 mph as it’s used to send astronauts on future missions beyond Earth’s orbit, including to an asteroid and ultimately to Mars. This is the third firing of an RS-25 development engine on the A-1 test stand at Stennis. The first RS-25 test in this series was conducted January 9, and the second was May 28. Four more tests are planned for the current development engine. The first flight test of the SLS — designated as Exploration Mission 1 — will feature a configuration for a 70-metric-ton (77-ton) lift capacity and carry an uncrewed Lockheed Martin-built Orion spacecraft beyond low-Earth orbit to test the performance of the integrated system. “We have several objectives that will be accomplished during this test series, which will provide critical data on the new engine controller unit, materials and engine propellant inlet pressure conditions,” Wofford added. The new engine controller unit, the “brain” of the engine, allows communication between the vehicle and the engine, relaying commands to the engine and transmitting data back to the vehicle. The controller also provides closed-loop management of the engine by regulating the thrust and fuel mixture ratio while monitoring the engine’s health and status. The controller will use updated hardware and software configured to operate with the new SLS vehicle avionics architecture. The test series will show how the RS-25 engines will perform with colder liquid oxygen temperatures; greater inlet pressure due to the taller SLS core stage liquid oxygen tank and higher vehicle acceleration; and more nozzle heating due to the four-engine configuration and its position in-plane with the SLS booster exhaust nozzles. New ablative insulation and heaters also will be tested during the series. Aerojet Rocketdyne of Sacramento, California, is the prime contractor for the RS-25 engine work. As the SLS evolves, it will provide an unprecedented lift capability of 130 metric tons (143 tons) to enable missions even farther into our solar system to places like Mars.